Kugutsu no Jutsu is a technique that was said to have originated in numerous places. However it was most commonly believed to have began in Sunagakure under the hand of Monzaemon Chikamatsu for theatrical purposes. He later adapted it to a versatile medium ranged Ninjutsu technique. Shinobi have seen mastered the art of Chakra Threads and Puppetry, wielding unimaginable ingenuity to craft their deadly tools. Puppet nin are often characterized by their lack of close ranged combat and skilled finger manipulations. Puppet Shinobi are skilled ninjutsu masters with excellent chakra control. They use their chakra to create threads that are then used to manipulate the dangerous contraptions they craft for their ninja art. As such most puppet nin lack exemplary hand to hand skill, though their abilities at strategy and deception are near unparalleled. Cost: 1 Cp per string used. 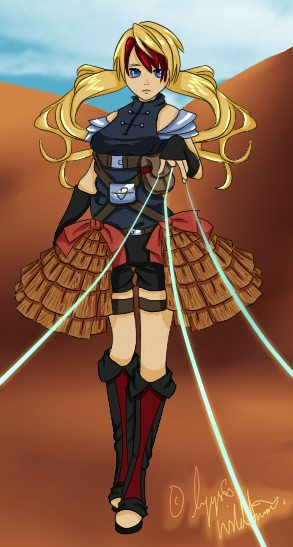 Description: The puppet nin wields their chakra in ten separate threads that they use to manipulate their devices. As they grow more adept with their skill they can use fewer and fewer threads per puppet. The greatest even capable of using one thread per device without sacrificing their skill. DF: Strings are manipulated using Dexterity. Manipulation rolls are all offensive actions. When manipulating a puppet the user is not required to pay manipulation cost for the puppet to defend itself. Tools: Each tool requires 2 strings to manipulate, with a maximum of three tools manipulated per round. Tools manipulated in this manner have a range of Short to Long. Puppets: Puppets require five strings to manipulate a piece, with a maximum of two puppets manipulated at one time. Basic Puppets: Basic Puppets may come in a vaguely humanoid shape with crude work done. One of these puppets is given to each Kugutsu user upon purchase. Further puppets can be made at the appropriate Ryo cost following Weapon Creation Chart. Hp: Puppets have Hp equivalent to the users Rank Hp+ Wis Modifier (As though Wisdom were Con). Damage Reduction: Puppets have Damage Reduction Equal to the Users Wisdom Modifier as though Wisdom were Con. Attack and Defense: Puppet’s Attack and Dodge with the User’s Dexterity Rolls. Range: Puppets have a Range of Short to Long. Damage: Puppets deal the user’s Rank Ninjutsu Damage. Advanced Thread Control is a stage of mastery after rigorous training. The Puppet nin capable of claiming this status have a greater degree of fine manipulation with their puppets and thread, granting heightened battle skill and a vaster pool of reiatsu to draw from after their adept work.